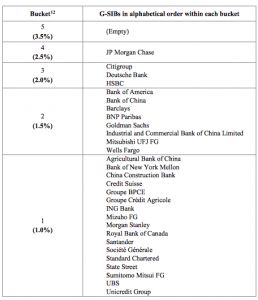 The Financial Stability Board (FSB), in consultation with Basel Committee on Banking Supervision (BCBS) and national authorities, has identified the 2018 list of global systemically important banks (G-SIBs), using end-2017 data and the updated assessment methodology published by the BCBS in July 2013. One bank has been added to and two banks have been removed from the list of G-SIBs that were identified in 2017, and therefore the overall number of G-SIBs decreases from 30 to 29 (see Annex). The changes in the allocation of the institutions to buckets (see below for details) reflects the effects of changes in underlying activity of banks. In November 2011 the FSB published an integrated set of policy measures to address the systemic and moral hazard risks associated with systemically important financial institutions (SIFIs). In that publication, the FSB identified as global systemically important financial institutions (G-SIFIs) an initial group of G-SIBs, using a methodology developed by the BCBS. The November 2011 report noted that the group of G-SIBs would be updated annually based on new data and published by the FSB each November. Higher capital buffer: Since the November 2012 update, the G-SIBs have been allocated to buckets corresponding to higher capital buffers that they are required to hold by national authorities in accordance with international standards. Higher capital buffer requirements began to be phased in from 1 January 2016 for G-SIBs (based on the November 2014 assessment) with full implementation by 1 January 2019. The capital buffer requirements for the G-SIBs identified in the annual update each November will apply to them as from January fourteen months later. The assignment of G-SIBs to the buckets, in the list published today, determines the higher capital buffer requirements that will apply to each G-SIB from 1 January 2020. Total Loss-Absorbing Capacity (TLAC): G-SIBs are required to meet the TLAC standard, alongside the regulatory capital requirements set out in the Basel III framework. The TLAC standard will be phased-in from 1 January 2019 for G-SIBs identified in the 2015 list (provided that they continue to be designated as G-SIBs thereafter). Resolvability: These include group-wide resolution planning and regular resolvability assessments. The resolvability of each G-SIB is also reviewed in a high-level FSB Resolvability Assessment Process (RAP) by senior regulators within the firms’ Crisis Management Groups.Higher supervisory expectations: These include supervisory expectations for risk management functions, risk data aggregation capabilities, risk governance and internal controls. In November 2014 the BCBS published a technical summary of the methodology. The BCBS publishes the annually updated denominators used to calculate banks’ scores and the thresholds used to allocate the banks to buckets and provides the links to the public disclosures of the full sample of banks assessed, as determined by the sample criteria set out in the BCBS G-SIB framework. 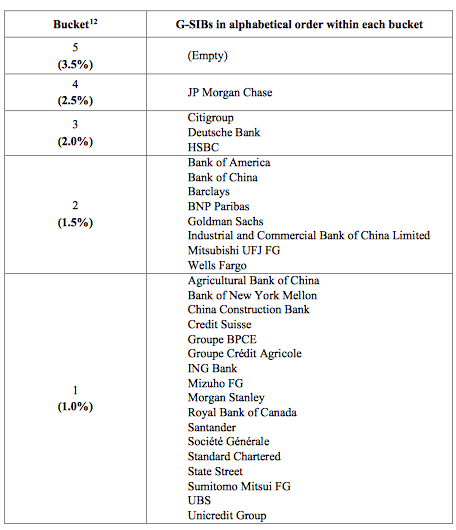 From this year, the BCBS also publishes the twelve high-level indicators of the banks in the main sample used in the G-SIB scoring exercise. The BCBS published in July 2018 a revised version of its assessment methodology, replacing the July 2013 version.10 The revised assessment methodology will take effect in 2021 (based on end-2020 data), and the resulting higher capital buffer requirement would be applied in January 2023.